vHost Review 2019: Is vHost a Good Hosting? vHost is a Vietnamese website hosting provider with servers in data centers located in Singapore and Vietnam. Their prices are affordable and their customer service is excellent. Founded in 2010, vHost is a Vietnamese website hosting provider. They provide customers with hosting services using top quality servers located in Vietnam and Singapore. Their informative website is available in Vietnamese. vHost is a website hosting provider providing domain registration, business hosting, Linux hosting, Windows hosting, SEO hosting, shared hosting, and email services. They also offer domain registration and SSL certificates. I am really impressed with vHost’s infrastructure and technology. They use Tier III data centers located in Singapore and Vietnam, meaning 99.9% uptime, as well as dual-powered servers and storage. They also use SSD RAID 10 storage as standard, which means disk reading speeds improved by up to 40 times more than conventional hard drives. Their website is very informative, providing extensive information about specific features that they use, many of which are top-class e.g., CloudLinux, DirectAdmin, Plesk, LiteSpeed Web Server, Softacolous, and Virtualizor. Unlike other companies, they have a very clear service level agreement (SLA), the openness and transparency of which was quite impressive. They have a dedicated page on their website which explains exactly what happens if they fall below 99.9% uptime. vHost’s prices are very competitive. They are in line with, if not lower than, local and international competitors. All of their plans come with unlimited bandwidth and a free Let’s Encrypt SSL certificate, however, domain registration is an extra cost and none of the shared website hosting plans include add-on domains. They offer three contract lengths; yearly, biannually, and triannually. The price is slightly reduced if you purchase a longer term however the discount is not too significant. They offer a seven day trial and also a full money back guarantee, although the specifics are not super clear on this. In terms of customer service, they offer a staggering number of options. Upon opening the live chat symbol, seven different ways to get in touch pop open. What’s more, their live chat is available 24/7 and they are extremely helpful. Every time I have contacted them, they have picked up within a few minutes and have been able to resolve my query. If that’s not enough, they also have an excellent resource center on their website. 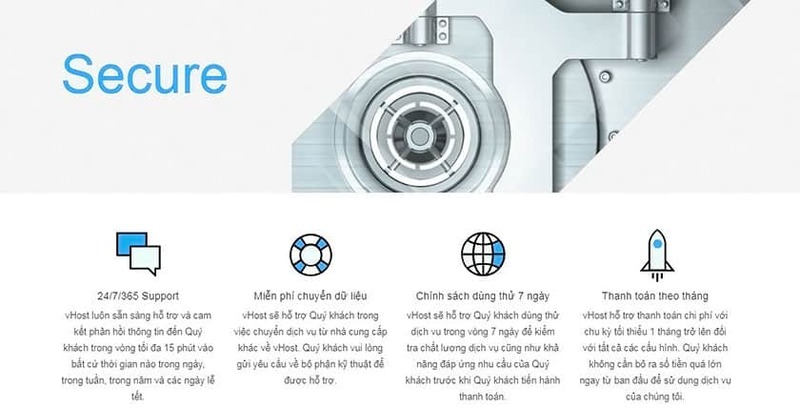 Their support is available in Vietnamese and also English. vHost owns and operates servers in multiple Tier III data centers in Binh Duong, Ha Noi, Ho Chi Minh, Vietnam, and one in Singapore. Wondering how vHost stacks up against other Web Hosting companies? Enter any other Web Hosting company and we will give you a side-by-side comparison.